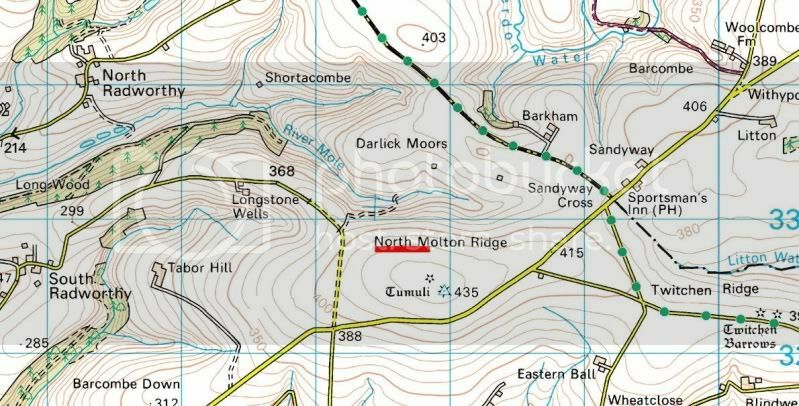 Visited a couple of possible new flying sites today on Exmoor...North Molton Ridge and Martinhoe Common, both not suitable, although I`m looking forward to Winsford Punchbowl, so anyone with more info on this one please post it. I hope North Molton Ridge works as its only 2 miles from the office!! I'll double check with one of the guys I know, who flies off there, and get back to you with a definitive map. ...I went up there this morning and found it and I was in the wrong place, there was a Southerly 16mph wind and very misty and loads of drizzle I launched SAS Venom on the South side and the lift was poor. The North side might well be better but will have to wait for a better day, and as usual stunning view`s. Here you go BB..........needs 15+ mph for a decent session. Fly in a Northerly along the red line. I was thinking of going there on Saturday evening - about 1700 onwards - then dropping off for a pub meal on the way back. Cycling around to Instow and back in the morning................so I might not be fit for anything after that! Had a couple of good flights with the Acacia at Wooly Mast after work today. DaveM had his Wild Thing attacked by a Peregrine Falcon..........darned thing wouldn't leave him alone, so he had to land. Soon effed off when I chucked the Acacia up though. Knew when it was beat, I reckon. 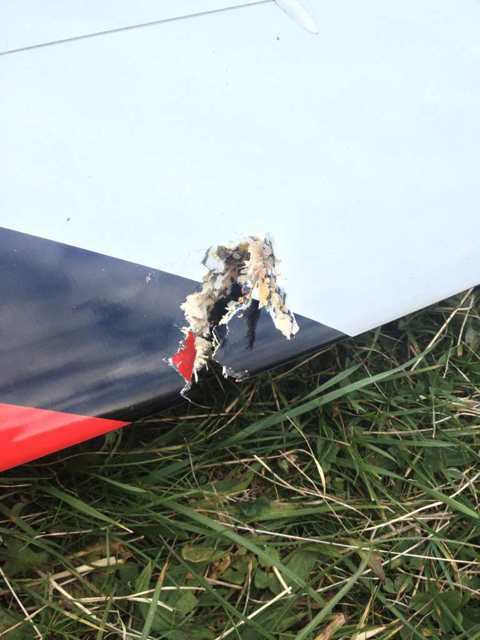 RE : Codden hill ......Anybody finding two pieces of a mouldie wing with some yellow or red tape on it please could you pick it up , my Hobbyzone super cub broke up in mid flight and bits went everwhere I found most of it. Just concerned not to leave flying related litter..thanks guy`s. - then dropping off for a pub meal on the way back. Sounds like er indoor`s is gonna missout ? 'Er indoors is paying for it.....................I just haven't told her yet! Good conditions at Countisbury Common yesterday. 7 launches and 1 landing with my Impulse....................don't ask! I am normally a South Cotswold sloper but am venturing down to glorious North devon next week, & am hoping to chuck something off Codden Hill which looks pretty good on your details. I will make myself known to any of you guys who might turn up. Weather not looking too good at the moment.........but things can change in a week. The North side of Codden is better than the South. The South works from S - SSW and needs a good 20mph on it to be really worthwhile. The North works from NNW - NNE and is a bigger and steeper slope which will work in less wind speed. Best to contact us on the Email below when you get down here. Slippery Sloper will almost certainly be up there if it's flyable. I'll be down Thursday afternoon/evening chaps with my Willow……looks like a WNW……where's best? Woolacombe Down works well in a WNW. It would be worthwhile having a trip up to Countisbury Common as well. Failing that, there's always Mortehoe. Never mind mate, I'll be at work paying for your pension! Won't e leaving Gloucester till lunch time I'm afraid so it's going to be late afternoon before I can get to a slope!! Looks like stonking condition`s for Countisbury common tomorrow ...anybody up for it ? Where do you think this afternoon/evening?? ..where did you fly ?.. Where did you do that ? My local slope!! The flap servo was not glued in very well (second hand plane) which gave way and made it spiral in!! Just to let you know bigbear that Codden Hill is looking good for thursday late afternoon, so if your working in SM dont forget a plane. Looks like rain as well. Page created in 0.821 seconds with 82 queries.